Our local library at Cheddar in Somerset, largely run by volunteers due to funding cuts, whistled up a wonderful surprise last week when the highly-regarded historical novelist Maria McCann came to talk to library-goers and fans. Maria’s novels have been picked by Richard and Judy, and short-listed for the Orange Prize. As I slog through November I’m finding that one of the joys of the NaNoWriMo website are the pep talks by established authors. Here’s one I just have to share, by successful romance novelist Stephanie Walker. She gets right to the heart of what NaNoWriMo is all about: getting that first draft of a novel – no matter how rough round the edges – down on paper within 30 days. Stephanie writes beautifully, with clarity and feeling. She’s just inspirational! Click for Stephanie Walker’s pep talk. Yep, the wait is over. SF/fantasy anthology On Another Plane, featuring the heart-stopping and heart-warming tribulations of astronaut Emily Harris in my story ‘Calypso Solo’, is now available from Amazon in paperback and ebook; also available for Nook and Kobo, as well as in print from Lulu. Happy reading, and if you do buy your own copy before sending others to your loved ones for Christmas, please consider writing an Amazon review. The best reviews might just get the writer featured in a future story! I’m excited. Very excited. Superlatively excited. Not that you would notice. What immensely significant event has occurred, you ask? 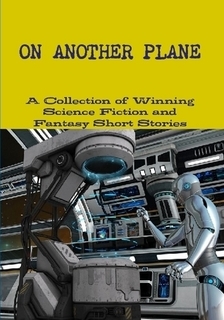 Only that my SF short story “Calypso Solo” has just been published by AudioArcadia in their anthology On Another Plane, edited by the wonderful Lindsay Fairgrieve.